This winter many of the blogs I read exploded with the news that RunKeeper, the popular mobile app for tracking activities, was free for a limited time. I quickly downloaded RunKeeper to save for warmer weather when I could really take advantage of it. I'm not that committed to my exercise that I do it through the winter, which incidentally makes the first few weeks of spring much more difficult. My exercise of choice is cycling, which I did very often with Brad until I moved 2 hours away from him last fall. I do run occasionally and will likely be running more in the coming months since the roads around my new city are much busier than I am used to and I have yet to get hooked up with any of the local cycling groups. Over the past three days I have ridden my bike and run, using RunKeeper to track my activities. Tracking is dead simple, especially since I have an iPhone 4 and simply use the gps feature to track my "vitals." RunKeeper tracks a multitude of information including distance, current speed, average speed, pace, etc. and informs you of this information on five minute intervals (this can be changed to every mile or on demand only). RunKeeper also has a great coaching feature, which can be set to help you stay at a target pace or for intervals. I have used the intervals coaching feature while running and it performed just as you'd expect it to. The final two things that have me sold on RunKeeper are its website and its display. Once you sign up for a RunKeeper account (free) all of your information syncs automatically with the RunKeeper website so you can view it in a much more viewing-friendly format later. The display gives you all the information you need in a format designed to be read quickly. As you can see in the screenshot above from my ride 2 days ago it is very easy to look down and find the necessary information (you can also change the primary display from pace to speed, which I have since done for my cycling as that is more pertinent than pace when on a bike). Finally, using RunKeeper's gps feature I am able to see where I have been and where my mile markers were. 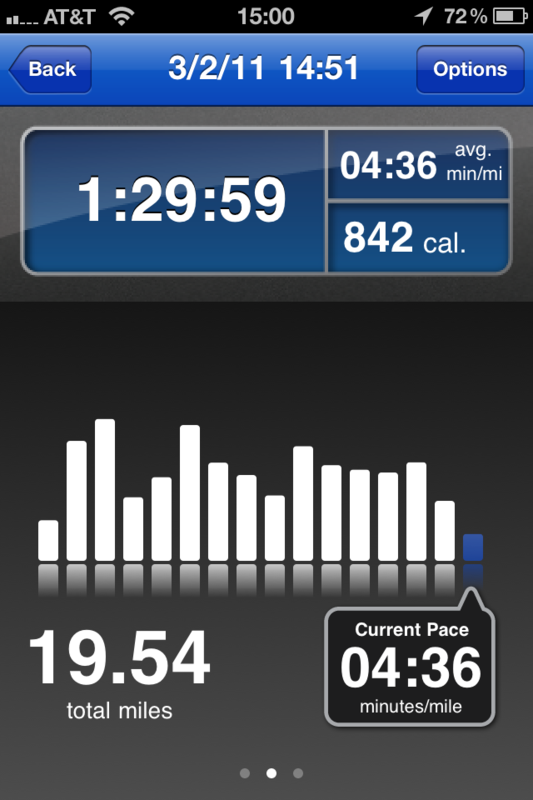 Additionally, RunKeeper keeps track of mile times which is more helpful for running than cycling, but nice nonetheless. It also allows you to race against yourself, telling you when you've posted personal records on specific routes as well as farthest distance in a given activity as well as farthest distance in a week and month. Overall, I would recommend RunKeeper to anyone that wants to stay fit and track their information in a well-designed and accessible manner.